Checklists are essential for airline pilots, construction managers, doctors, and building managers. This post summarizes the GSA’s building inspection outline to extend the life of the reader’s maintenance units. If building owners or maintenance managers invest money, care, and time into their units, the value of the property and assets will increase. This often requires use of preventive maintenance, rather than a “squeaky wheel” corrective maintenance approach. 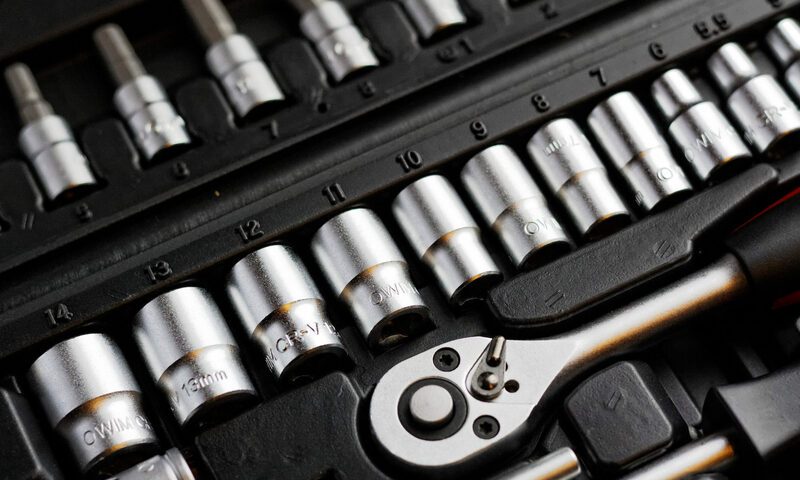 Corrective maintenance refers to a technique where building owners and maintenance managers do nothing until a failure occurs, where they “correct” the failure and continue on. 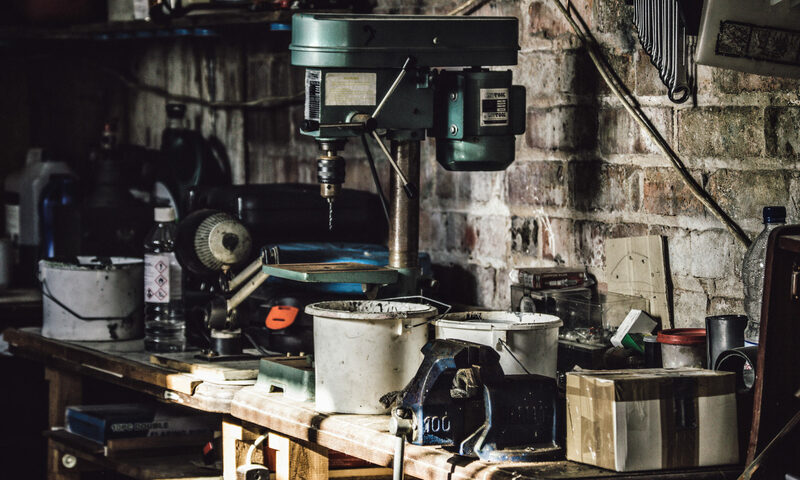 Depending on the asset, this can set the owner back with high repair bills and extra time spent repairing the failure, than if the owner had an preventive maintenance checklist in place. A preventive maintenance checklist takes up little of an owner’s time, but will comprehensively inspect a building. Preventive maintenance can be performed on a regular schedule and can simplify an owner’s maintenance approach. Owners and maintenance managers should pay careful attention to parts of buildings that are most likely to fail. Roofs and Roofing Elements: These should be inspected at least twice a year, particularly before and after harsh weather that may erode the roof. An unchecked roof can lead to leaks and building damages caused by leaks. Exterior Wall Materials and Finishes: Weather, such as sun, wind, hail, rain, etc, will wear away exterior wall finishes such as paint and mortar joints. They must also be regularly refinished, such as repainting when wear is visible. Fenestration: Weather-stripping must be applied and regularly checked to all sources of infiltration, such as doors and windows, to prevent energy and heat loss. Exterior Ceilings and Decks: Check for weather damage, particularly before and after extreme weather. Grounds: Owners should design their grounds to direct flow of rainwater away from buildings and parking lots to prevent stagnant water. Check the grounds after heavy rains to check drainage. Interior: Check foundation walls for cracks, leaks, or condensation problems caused by rainwater or moisture. Dampness and mold may be found where the first floor meets the foundation wall. Mechanical and Electrical: Check that electrical power circuits are serving all aspects of the building, particularly in older buildings. Inspect heating elements such as ducts, furnaces, radiators and registers. Attic: Attics may develop condensation, check for adequate ventilation to prevent this. If building owners or managers follow this guide buildings should have an extended life and heavy failure bills may be avoided. A more detailed version of this checklist may be found here for interested readers. The Value Assessment Method was designed by researchers to aid the U.S. Army maintenance managers with their preventive maintenance programs. As long as the Value Assessment Method is followed strictly, it can be transferred to serve other companies and organizations with their preventive maintenance systems. The values of preventive maintenance system activities change regularly, with modifications or phase-outs of systems, changes in needs of installed equipment. 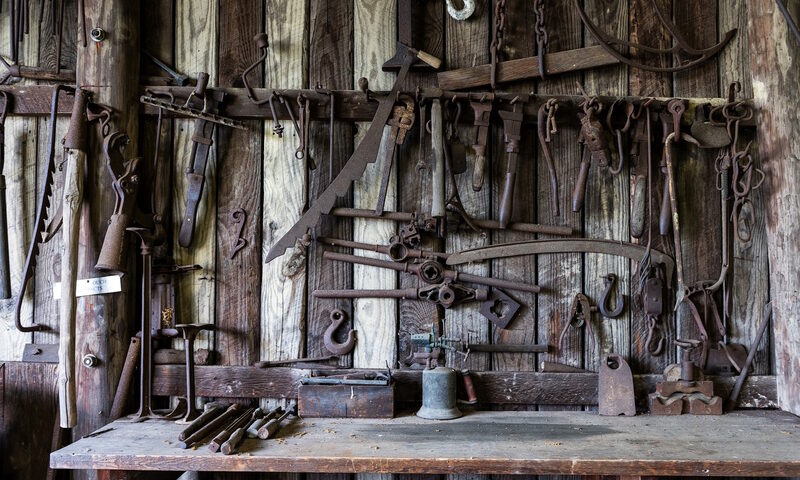 The Value Assessment Method is meant to assess the value of preventive maintenance activities regularly before large returns from the activities can be seen in the long run. 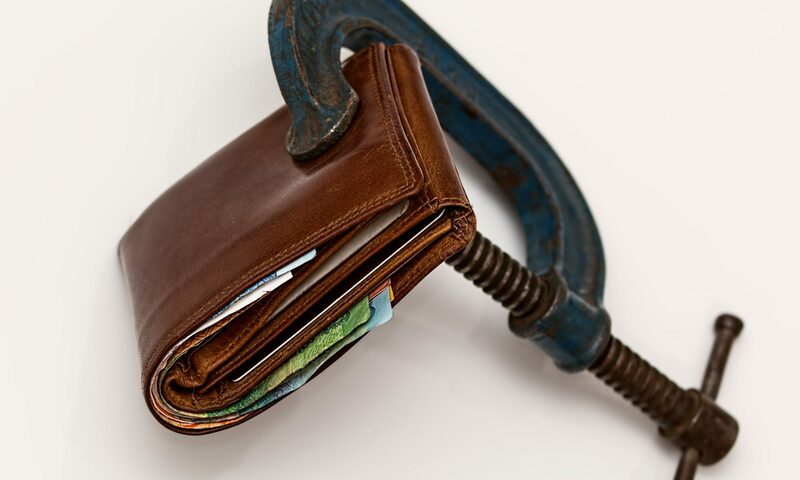 This allows maintenance managers to respond swiftly should the Value Assessment Method find that preventive maintenance activities are working inefficiently, before losing money long-term on those activities. Maintenance managers can use the Value Assessment Method to justify specific preventative maintenance tasks, as well as determine specific preventive maintenance workload deletions during budget cut periods. a) Systems and equipment supported under each category/unit are identified and listed. b) All PM tasks associated with each unit are included. c) Priority and cost-effectiveness are attributed to each PM task. The Preferred PM Task List is a spinoff of the General PM List and shows a priority ladder for each PM task performed at the time of installation. This list is created by reordering tasks from the General PM List by cost benefit balance and level of the tasks’ parent categories to determine new task orders. Should two tasks have the same cost-effectiveness and parent level, decreasing assignable work hours will determine the order. In a complete Preferred PM task list, each PM task will have a unique sequence number as its label. The Preferred PM Category and Task List is another spinoff. The only difference between this list and the previous is the PM tasks are grouped under a parent category in the sequence number order. It can be used as a modification of the General Preventive Maintenance System List for PM managers’ convenience. When followed correctly the combined lists of the Value Assessment Method can ease the headaches of even the busiest maintenance managers. However, it requires due diligence and keeping all of the lists updated to be truly successful. 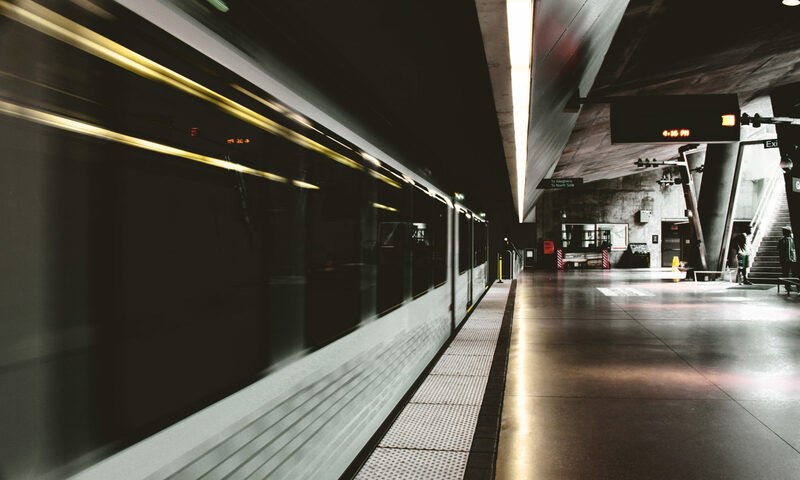 An effective preventive maintenance program should find issues before they morph into problems, and tracking it all carefully will help you know if your building’s operations are headed off track or if they’re staying true to best practices. Preventive maintenance (PM) is an action carried out in a programmed manner to keep equipment in the desired functioning state. Another objective of PM is to detect corrective maintenance action to be taken to prevent an emergency or a non-productive situation. Life Cycle Engineering explores the difference between CM and PM. Corrective Maintenance (CM) is an action where a repair or adjustment is carried out to solve a condition detected during the PM process due to the fact that the correction was beyond the allocated time or resources of the PM. Implementing a PM program based on the manufacturer suggested interval is a good starting point but that cannot be the benchmark. This routine requires adjustment, based on the operation history of the equipment. The frequency of a PM in a facility should be based on ‘Mean time between failure’ (MTBF). This permits to calculate a realistic time frame in which checking the equipment, can lead to identification of potential problem. Effectively fixing these problems through CM extends the MTBF of the equipment. Impact of the equipment failure on production and safety. The history of the equipment. The technology used in the equipment. The desired productivity of the equipment. The amount of resources available. Working through all these factors, if the ratio of preventive maintenance to corrective is approximately 6:1 (for 6 PM there is 1CM) the preventive maintenance program can be called reliable. This is a proven theory and holds good for many facilities though it cannot be steadfastly held for all PM and for all processes. The proper ratio of PM to CM should be determined only after a detailed analysis of past performance and PM work order history and cannot remain as a guess work. Excellence in maintenance can only come from a dedicated proactive approach and applying proven processes. Preventive maintenance activities must face frequent economic reviews to judge their efficiency. Maintenance managers can use their cost and technical data with this assessment to decide the cost-effectiveness of their preventive maintenance activities. Preventive maintenance activities often only show returns in the long term. Therefore, it is critical to run regular economic reviews of preventative maintenance activates, to chart their efficiency and effectiveness. Though cost and technical data will differ between maintenance managers and their assets, general ideologies for managing systems remain. The U.S. Army follows a strict set of guidelines for their preventive maintenance activities, examined in detail here. 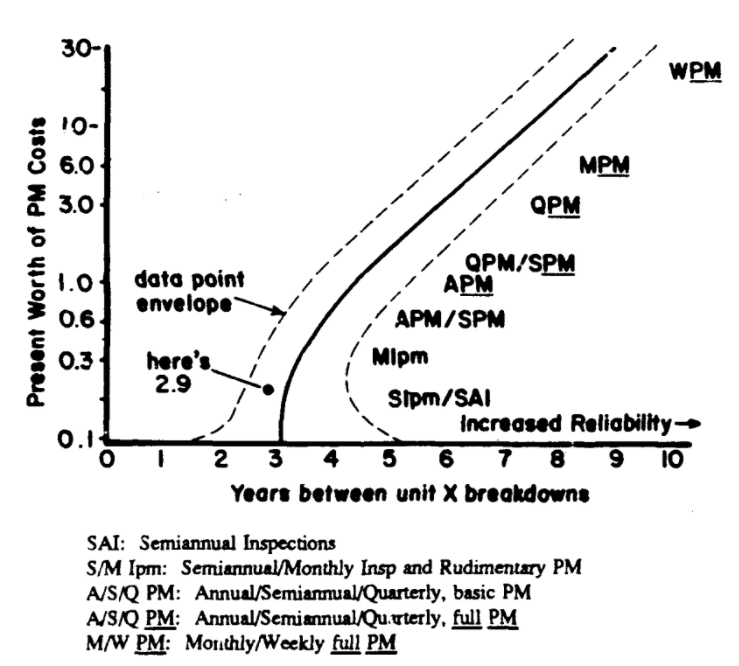 Correlation of PM level and elapsed time (years) before unit failure. Preventive maintenance activities of a unit are handled based on priorities, human and financial resource availability, and the unit’s technical data and it’s preventive maintenance program. Maintenance managers should take note that different reasons exist for keeping a PM activity on their work roster and for scheduling a PM activity. The decision of whether or not to add an activity to the PM work roster is based on the value of an activity to the installation, as well as the activity’s cost-effectiveness. Whether or not to schedule a PM activity relates to the coordination and timeliness of the activity. To effectively schedule preventive maintenance activities, managers must have knowledge of priorities and available resources. Depending on how often operations systems require inspections and servicing, PM scheduling can be fixed (required and performed at set times), variable (required, but with flexibility), or optional (preferable, but can be skipped without consequences). Maintenance managers should take care to collect and interpret maintenance data regularly, building complete maintenance histories from their operations records (using preventive maintenance software can help). The history of a unit should include the unit’s installation date, repair, maintenance, and inspection records of the unit, and the unit’s type and cost of replaced parts. This allows for managers to enter accurate and regular proposed maintenance schedules. Using the maintenance data collected over time, including fail-rates, managers can determine the benefits of a preventive maintenance program. This can be calculate by the net savings gained by performing PM on a unit, over not performing PM. Managers can use this information to define trends, which can be charted out into graphs for easier understanding. The information generated by maintenance data and their charts can extend the overall life of a unit. Maintaining your roof takes time and discipline. The Massachusetts Dept. of Capital Assets summarizes their building roof preventive maintenance guidelines. Preventative maintenance for roofs is not as easy as it looks. Maintaining roofs isn’t too demanding but requires specialization and time commitment. Regular checks and maintenance is a must, even when funding is low. When it comes preventative maintenance for roofs, if an organization does not have that expertise in house, it is best to reach out to an external agency with that level of expertise. According to statistics, it is estimated that every dollar spent on a comprehensive framework for roof maintenance is five dollars saved in expenditures for repairs and extended roof life at a 400% ROI. Generally, preventive maintenance software is estimated to have a 545% ROI. Two key elements in roof asset management include inspections and repairs. While these are broad indicators, sub-categories are defined based on specific needs that vary, such as climate and temperature changes, roof access options or the roof type. the initial inspection, seasonal inspection and damage inspection. The purpose of the initial inspection is to make sure that proper installation has been undertaken and there are no issues. Seasonal inspection is a routine inspection that must be executed twice every year – typically, in fall and spring. The seasonal inspection is mainly preventative and makes certain that no defects have emerged over summer or winter such as high temperatures and wind damage. Damage inspections are usually performed when there is some kind of severe weather like a thunderstorm or hail. These preventative maintenance guidelines usually require roofs to be inspected based on the number of factors that might cause wear and tear to the roof. Besides natural causes, these include foot traffic, chemical damage, and wind damage. Walking over roofs result in minor cuts and punctures on the top later and affects the compressed roof insulation. It is best to minimize foot traffic as much as possible to maximize the life of the roof. In addition, single-ply roods experience chemical changes that weaken their life line. During inspections, experts look for changes in color or consistency of roof membrane which might lead to cracking. High winds can damage the roof membrane in several ways, leading to puncturing from carried branches or displaced ballasts. Last but not least, the inspection of roofing has to include both exterior and interior inspection that is targeted towards the state of the roof membrane. Exterior inspection involves assessing whether water has penetrated into the membrane – this can be done by walking on the roof and checking for spongy insulation patches. Interior inspection by contrast, is checking the ceiling and upper floors of the building for possible water damage. Building owners can take on some aspects of preventative maintenance through maintenance staff and maintenance software. At a 545% ROI and with cost reductions totaling $0.33 a square foot, preventive maintenance savings are worth the investment. Preventive Maintenance (PM) is vital for the effective functioning of all equipment across many industries. 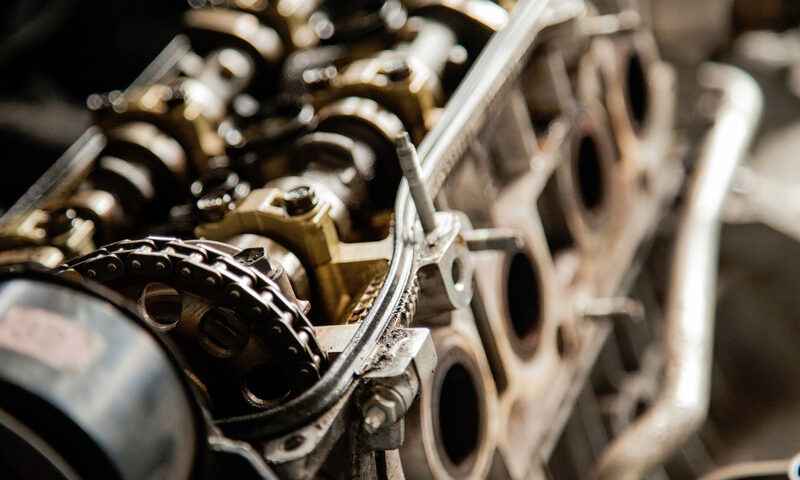 While preventative maintenance has been a priority for most companies, there is less clarity on what kind of value it has with regard to returns. 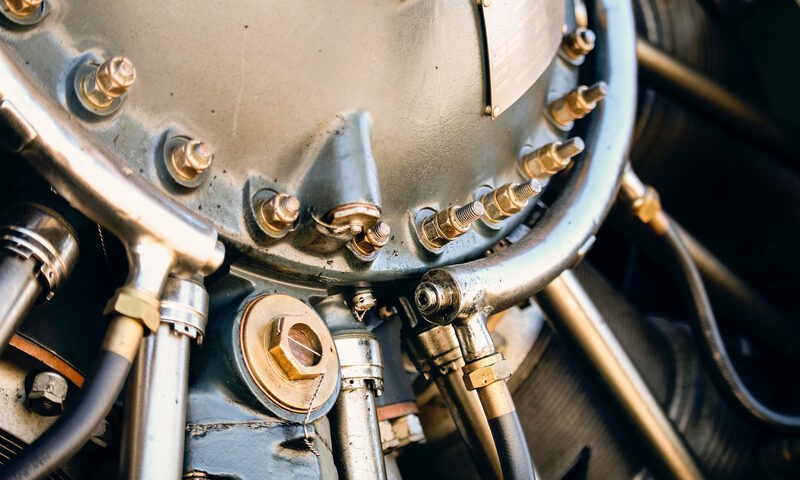 A better approach is to streamline a process for assessing how preventive maintenance software provides value through the lens of financial ratios. The lack of concrete statistics and evidence-based examinations point to the need for evaluating preventive maintenance with reference to mitigating risks and protecting assets. 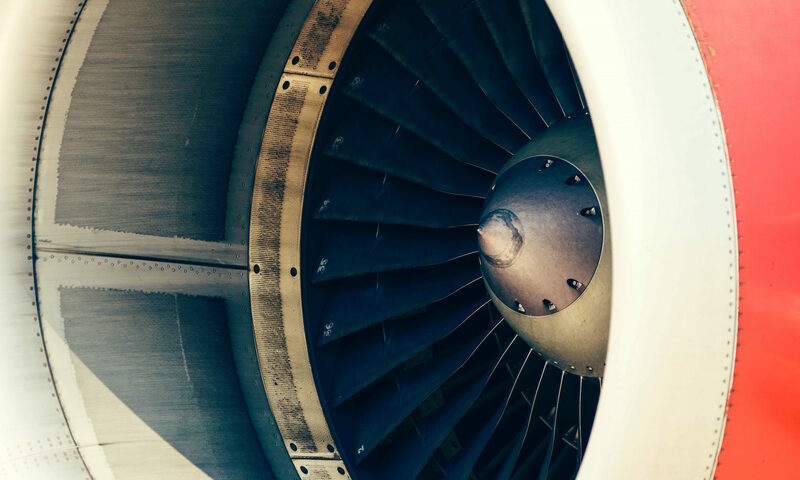 A perfect example of quantifying the preventive maintenance ROI can be seen in an analysis carried out by a company to create a financial model, in partnership with Jones Lang LaSalle (JLL). The analysis explored the current value and investment returns gained upon funding preventive maintenance for portfolio of buildings. 1. NPV of preventive maintenance is calculated by comparing repair, energy and replacement costs for PM and non-PM scenarios and bringing the costs to a present value using an assumed discount rate. 2. EUL refers to estimated useful life. 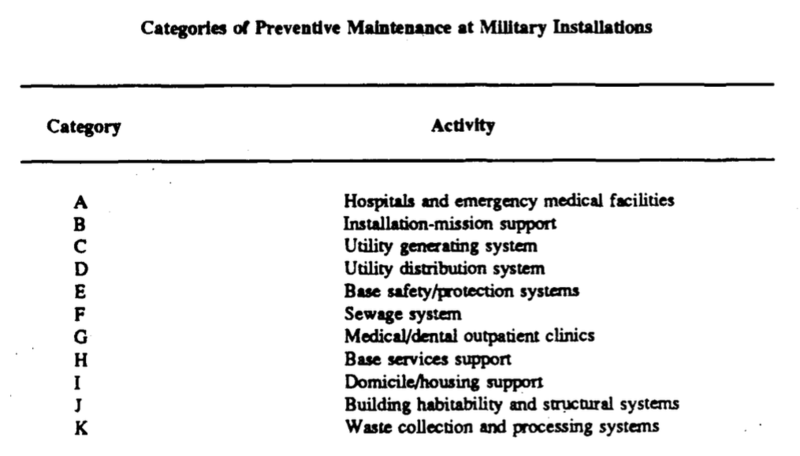 Criteria used for assessing the utility of preventive maintenance included the equipment’s actual costs, costs involving repairs, costs involving replacements, the expected life cycle and effects of preventive maintenance on life cycle. It also comprised of the frequency of repairs required when the equipment is in poor condition and the consequences of preventive maintenance on energy usage. 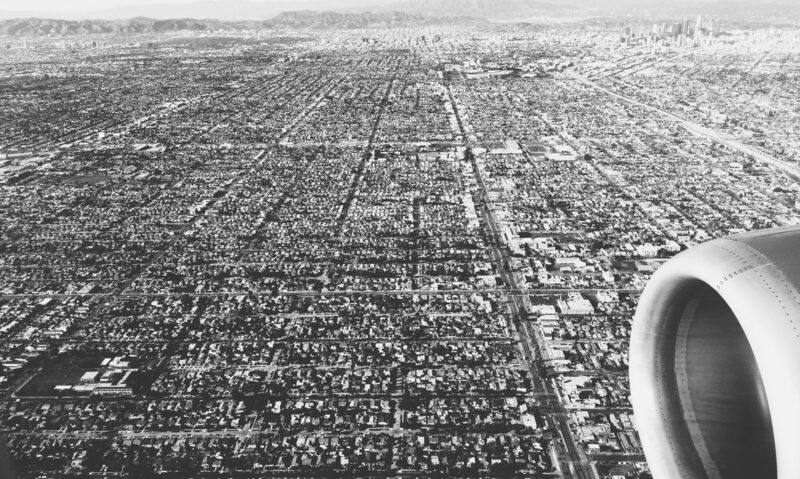 To start out, 12% of the company’s portfolio was surveyed – approximately 14 million square feet. For every property, the type of equipment, the number of equipment, size and age of equipment as well as expenditures incurred for preventive maintenance was calculated. The financial model was compiled using the following assumptions: discount rate of 10%, inflation rate of 3%, time horizon of 25 years, non-productive lead time of 10% and lost revenue due to downtime at zero (i.e. this could not be quantified due to downtime). 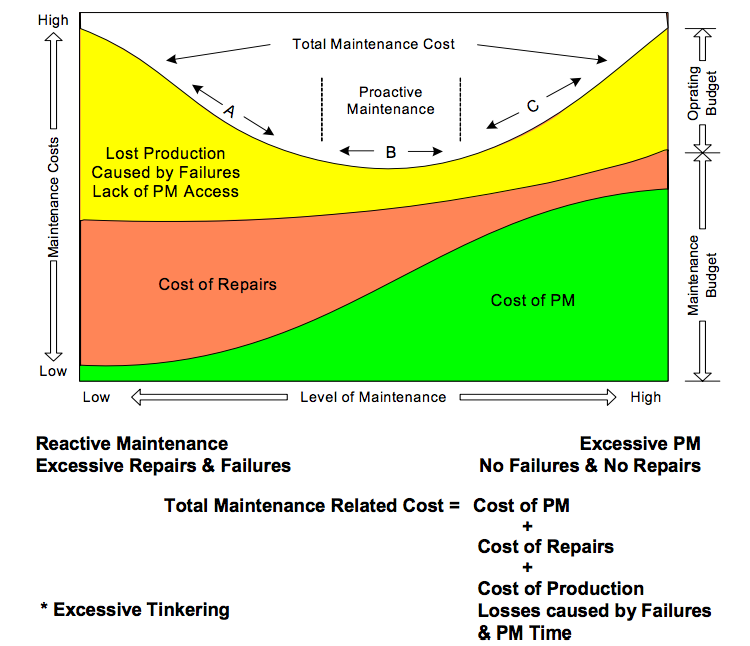 Based on this model, the team could pinpoint the effectiveness of preventative maintenance on specific equipment. For example, if a company has an air compressor of 7 horsepower that is 10 years old, will it make sense to invest in replacing the compressor at $32,900 or utilize preventive maintenance? According to the model, the compressor would last 20 years with preventive maintenance versus 16 years without it. The preventive maintenance costs would amount to only $472 per year. In addition, the team explored three possible scenarios related to preventative maintenance programs. The first one assumed that a company is having zero spending on preventive maintenance. The second one assumes that the cost of preventive maintenance is the actual amount spent at the time of analysis. The third scenario assumes that the company spends what is known as the industry benchmark on preventative maintenance measures. The results when comparing scenario 1 to 3 showed that preventative maintenance brings huge returns in investment. Returns are chiefly due to maximising on the full life potential of equipment. Preventive maintenance and corrective maintenance costs vary depending on organizations and their assets, but a cost-benefit analysis shows the way. Asset industries require sustainable maintenance strategies to stay cost effective and competitive. These maintenance strategies can be divided into corrective maintenance (CM) and preventive maintenance (PM). Corrective maintenance identifies and corrects a maintenance fault after it has occurred, while preventive maintenance is carried out in an interval fashion, intended to prevent maintenance faults from occurring. Based on their assets and industries, companies may find it more cost effective to use one over the other. An effective preventive maintenance software system would follow the 80/20 Pareto principle – with either CM or PM taking up 80% of the maintenance costs and time. Each company’s needs are different and a cost-benefit analysis (CBA) should be run before a strategy is selected to decide how much of a total maintenance time and cost should be devoted to either CM or PM. Before selecting a maintenance strategy, companies should consider a number of influencing factors such as: costs of downtime, redundancy and items’ reliability characteristics. For example – if an item has a high reliability level – CM may be more cost effective. Further, companies must clarify which activities belong to preventive or corrective maintenance. This can vary from organization to organization and requires an insider’s knowledge to decide. Once decided on – resources used for each activity should be registered in an CMMS preventive maintenance software system. Companies should be aware that in these systems, data quality and analysis will depend largely on human inputs – meaning there may be room for human error. Finally, companies should be aware that some costs may be difficult to estimate, particularly indirect costs and outsourcing costs (see this analysis in the Journal of Structure and Infrastructure Engineering). A company must consider direct costs and indirect costs when deciding between CM and PM. Both maintenance systems are associated with direct and indirect costs. Direct costs are those for labor and materials, while indirect costs refer to everything else. Common operation and maintenance data involved are: maintenance times (administrative time, logistic time (LT) and active repair time (RT)), DT, delays, failures, remedies, causes and item information. The recorded maintenance data can vary between PM and CM, as well as between organizations. To determine which maintenance system to use, a company must assign a monetary value to the operation and maintenance data mentioned above, and then run those values through a cost-benefit analysis. CBA is then meant to rationalize the decision a company makes, based on a cost-effective and long-term sustainability model. For example, if 70-90% of the maintenance costs are coming from CM-related activities, the company may choose to go to a PM maintenance system, which could in-turn remove up to 70 or 90% of their costs.